Goodreads Summary: New York, Los Angeles, and Washington, D.C., have been abandoned. The Bill of Rights has been revoked, and replaced with the Moral Statutes. A love story set in a harsh, post-apocalyptic world is right up my alley and while some of the plotting in Article 5 was unexpected, I enjoyed the book overall. Article 5 is set in a war ravaged United States. We are not given much information about the war and at the very least, I would have loved to know who we fought against, what we were fighting over and how the country became so extremist so quickly. As a result of this war, the US has abandoned the Bill of Rights and become an extremist religious country. In short, America has become the ‘Christian’ version of Afghanistan as it was under Taliban rule. I’m guessing the book describes a Christian government is the military insignia consists of a US flag flying over a cross and there are references to people reading the Bible. However, there is absolutely nothing Christ-like in the way the country treats its citizens. The government harasses, arrests and executes people (without trials) over what they consider moral shortcomings while thousands of others have nothing so they starve and freeze to death. Did this characterization bother me? A little. It felt a bit political especially in this election year and I do not like politics in my YA books. I have no idea if this was the author’s intent and thankfully, the government is not the novel’s focus and only really discussed in the first potion of the book. The book does focus on Ember, a girl who struggles to keep her and her mom under the government’s radar. Ember is responsible and takes on the parent role in the relationship, so when her mom is arrested, Ember reacts in the way that a mother would react if their child was taken. She becomes desperate to find and free her mom, even at the expense and safety of others. I thought Ember was self absorbed and annoyingly inconsistent at the beginning of the book but she does experience a lot of character growth throughout the novel. One of the great things about the book is there is no love triangle! Ember and Chase have a very complicated relationship. The reader sees the Chase that Ember fell in love with through her flashbacks and we see Chase as he is now, broken, brooding and tormented. I love Chase. It quickly becomes obvious (to everyone but Ember) how much he cares for her. On Ember’s part, she feel extremely betrayed by him. I usually don’t like a lot of angst, but in this case, it works. While there are the few things that I mentioned that I didn’t care for in Article 5, there is a whole lot more that I loved! This book is a nail biter! The action starts right away and continues at a quick and steady pace. The characters get themselves in situations that had me on the edge of my seat. The writing is solid and the romance, especially the flashbacks of Ember and Chase, is sweet and intense. 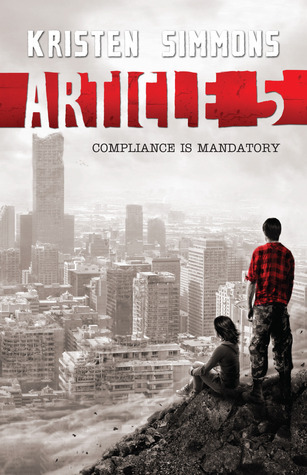 Article 5 is an awesome addition to the dystopian/post apocalyptic genre and I am really looking forward to the next book in the series. Content: Kissing and heavy violence. i'm reading this one next!! looks awesome! Huh. The "Christian" government sounds a bit political to me, as well. It sounds a lot like the worldbuilding in the graphic novel V FOR VENDETTA, in which the Catholic church has taken over the government. This seems like a liberal's worst nightmare. haha Stuff like that REALLY irritates me, so I'm not sure I'd be able to get through this one. I'm glad you mentioned it! I love nail biters and I also love romance in a post-apocalytic world. All things right up my alley as well. I'm looking forward to this one. And it's all good there are always things I don't like in every book even my 5 stars ones. I am also happy there is no love triangle! You have no idea how sick of those I am and I have been trying to find more and more books without them. Kissing and heavy violence?! My TWO FAVORITE THINGS!! I need to buy this book ASAP! Great review! Ohhh, I like the sound of this book. I'm so glad you mentioned the weird politics vibe the book has, especially the crazy religious part. I'd rather know that up front about a book. Great review. Plus, no love triangle is a serious bonus! haha! This is on my list. Great review! "However, there is absolutely nothing Christ-like in the way the country treats its citizens." --> Seriously. The government and their moral statutes made my skin crawl. I loved this book so much. I loved the characters and the world. I really, really loved Chase. I loved the way he was revealed in tiny bits and by the time I knew him fully in the end, I was head over heels in love with his character and what he did for Ember. What a guy! And he was written so smartly, in my opinion. Great thoughts on this one! I can't wait for the next book to come out.